I hate it when I forget my fabric grocery bags!! URGH!!! I try so hard to remember. They are hanging right by the door! But, it happens every once in a while. I’ve been known to shove 10 lbs worth of groceries into my purse, just to avoid a plastic bag. 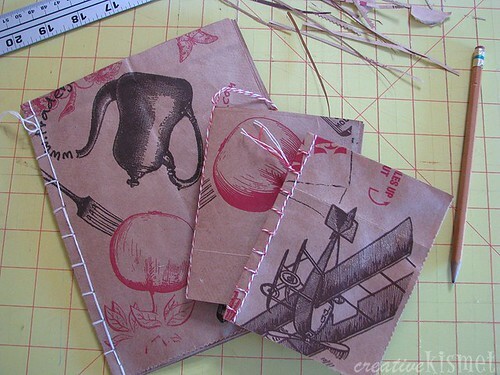 I was able to get 2 small journals (4 x 5 inches) and one large journal (8 x 6 inches) from two brown paper bags. For two small journals cut 16 pieces measuring 5 x 8 inches. Eight sheets for each journal. For the large journal, cut the paper into five or six 8 x 12 inch pieces. I ironed each sheet with steam to get them flat and then folded each sheet in half. Then I hand stitched the binding using THIS TUTORIAL. For one of them, I hand stitched a straight stitch. *Color study, paint a different color on each page and then write feelings or draw pictures that each color evokes. *Words. Write a random word on each page then paint, draw something that is associated with that word. *Copy old black & white photos of family members and paste them to your journal. Paint colorful hats, dresses, vests on everyone. *Use pictures from magazines and paste them in your journal. Fancy them up with markers, pens, paints, colored pencils. *Make a numbers or alphabet book with the kids. *Themes: Pick a theme , make a list then and fill your journal with each listed item. The great thing about these journals is that they are a really inexpensive way to get creative with art. There is no pressure to make a masterpiece, just a really fun way to get ideas down on paper and experiment. This entry was posted in Art, Fun kid stuff, i make stuff, Recycle,Reduce,Reuse, Tutorials, how to. Bookmark the permalink. how great this is! wish I could just sit down and paint up some creation that didn’t look like a 2 yo’s drawing! love your work! What a great way to reuse these paper bags. I have a bunch of them I didn’t know what to do with. Very cute! 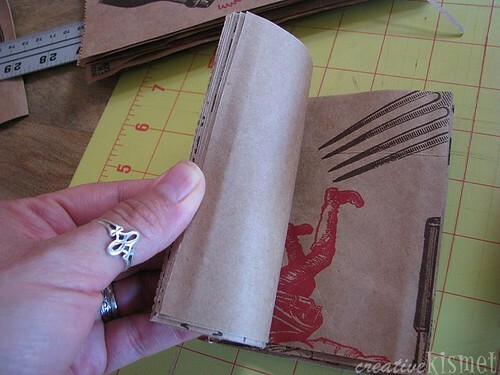 I love paper bag books…they are so much fun and have endless possibilities! Whoa, what a great idea! I love this look and they’re SO cute! Thanks so much, I’ll be linking. I saw this on One Pretty Thing and love it. Thank you so much! 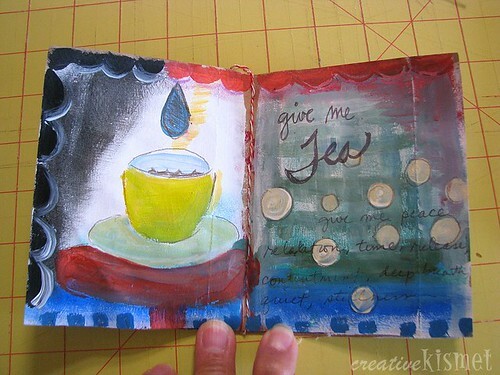 I like your ideas about how to use the journal as well as how to make it. Love, love, love this! 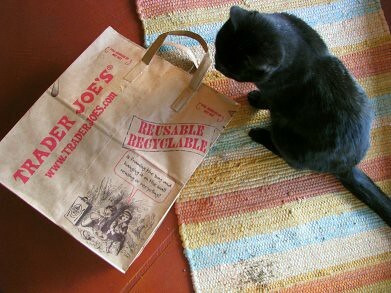 And I love TJ’s bags–they’re not just your ordinary brown paper bag. I think I will have to *forget* my reusables on my next trip there. Whoops! I forget my reusable bags about 50% of the time!!! I will have to ask for paper next time. I love your art journal spread. Now off to browse the rest of your blog! I love your journals, beautiful. Thank you for sharing the tutorial. I love this idea! So simple, and yet how fun to have a new little book to paint and draw in. 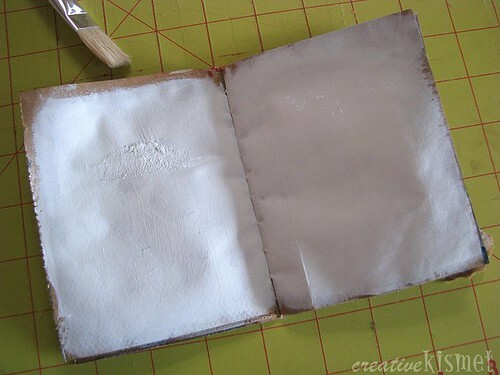 I don’t know why I’ve never thought of painting gesso down on the page. Great idea. I know exactly how you feel about forgetting your cloth bag! This is a fantastic idea. I made some of my plastic grocery bags into a reusable bag: http://learningandyearning.wordpress.com/2010/11/13/plastic-bags-the-bane-of-my-existence/. A good way of expressing ones creativity! I like your post. Keep it up!